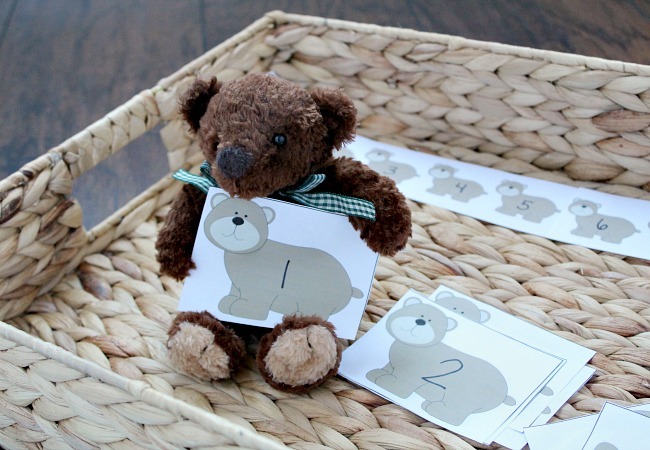 Create a number line for preschoolers with this bear number game that will encourage your child to learn numbers using hands on fun! Here’s how to play. “It is time to sleep” says the bear. Teaching your child about hibernation can be a fun way to introduce winter and have the discussion about how animals sleep. One way is with the book Time to Sleep by Denise Fleming. The other animals one by one tell each other the signs of winter and that it’s time to sleep from the big bear to the tiny ladybug. We’re highlighting the bear for this activity. You can view our top 10 Bear Crafts and Activities here. A perfect match to last week’s Weekly Virtual Book Club for Kids theme of Winter. Grab your book below on amazon or at your local library. 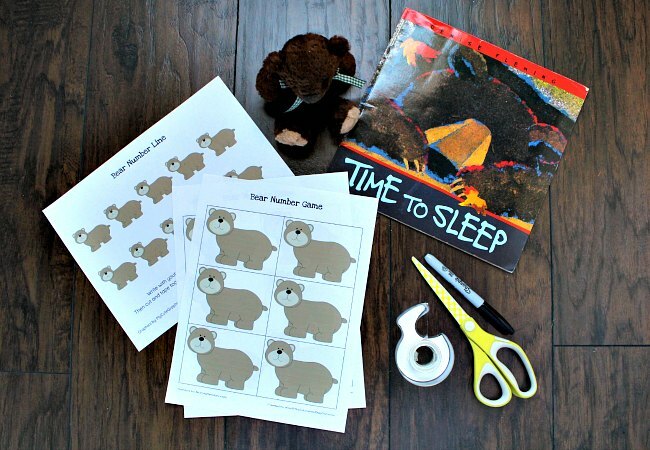 One of the main focuses of the book is about hibernation so I’ve created a playful number game for your child that’s about hibernation and bear. It’s quite simple but teaches number recognition and numerical order while your child is getting some movement too. 1. 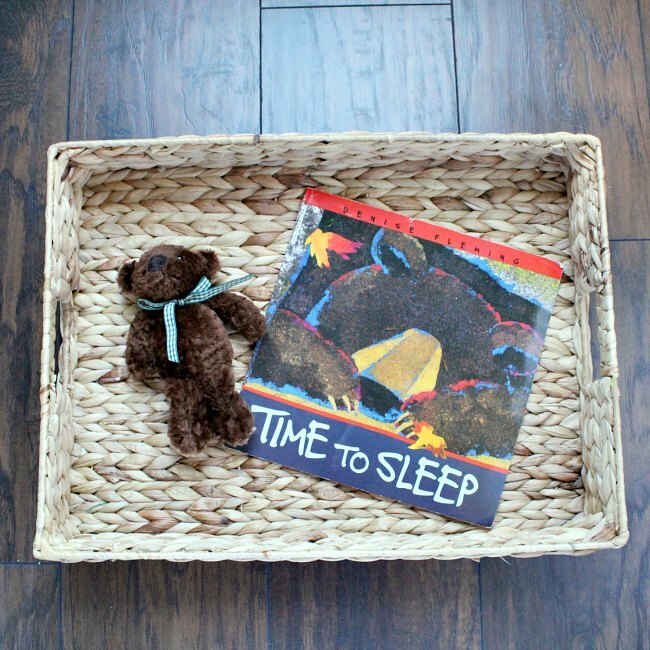 Read a bear themed story, we choose Time to Sleep by Denise Fleming since it focuses on hibernation. We grabbed a few bears from our animal collection to read along with the story too. 3. With your child write the numbers in order on the number line. If your child can write numbers take this time to have them write them with you. Then cut into two pieces to attach into one line using tape. 4. 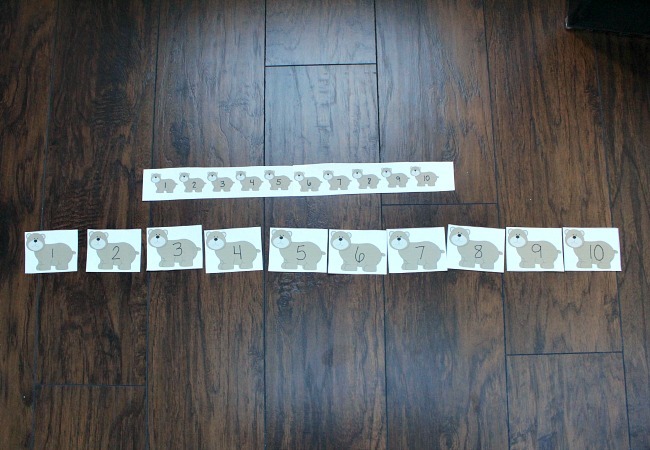 Once you’re made the number line it’s time to write the numbers on each of the bigger bears from the bear number game. 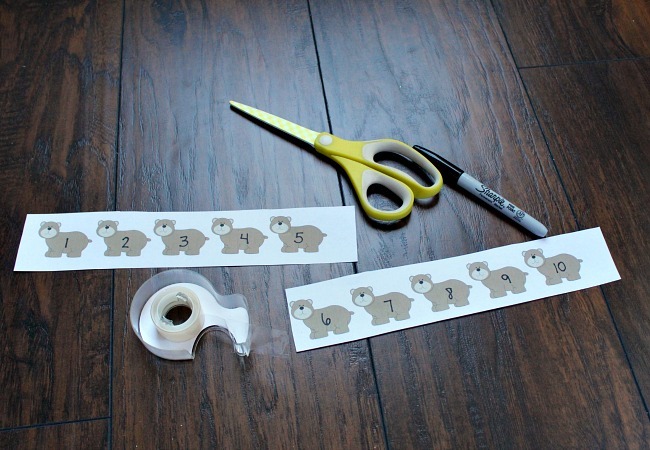 One by one work with your child to write the numbers on the bears. For younger children you can write the numbers for them as they watch and you discuss. You can also use fewer numbers from 1-6 for those just beginning to learn numbers. 5. Now it’s time for the FUN. Have your child cover their eyes or close them while “Bear” goes around the house to hide all of the bears that are hibernating. Start off with pretty easy spots and then get more complicated as they begin to understand the game. 6. As you child finds all of the bears in hibernation they can bring them back to the number line and place them in numerical order next to the number line. You can add to the fun by giving them binoculars and a flashlight to find the bears in hibernation. For older kids you can also have them illustrate the other animals from the story and have them hibernate and have your child find them. 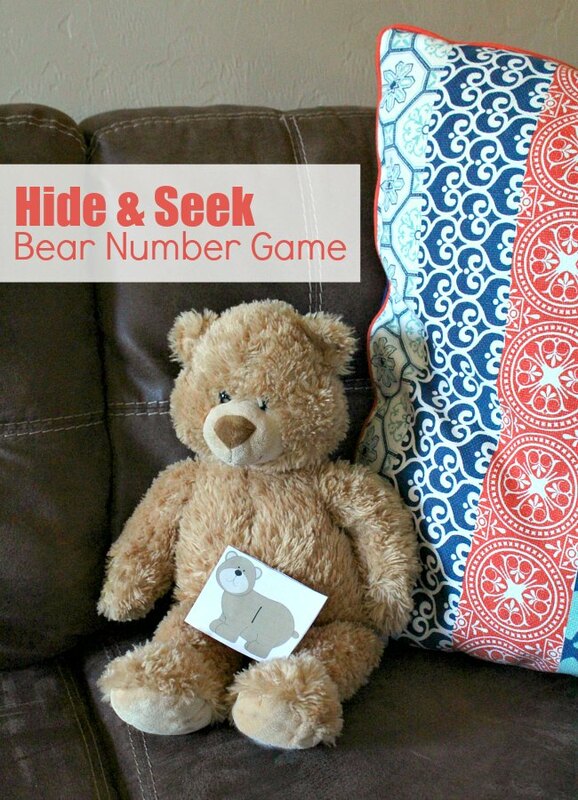 There are so many ways to play this Hide and Seek Hibernation Game. Here’s how it will look when the Hide and Seek Bear Number game is complete. Are you ready to play? 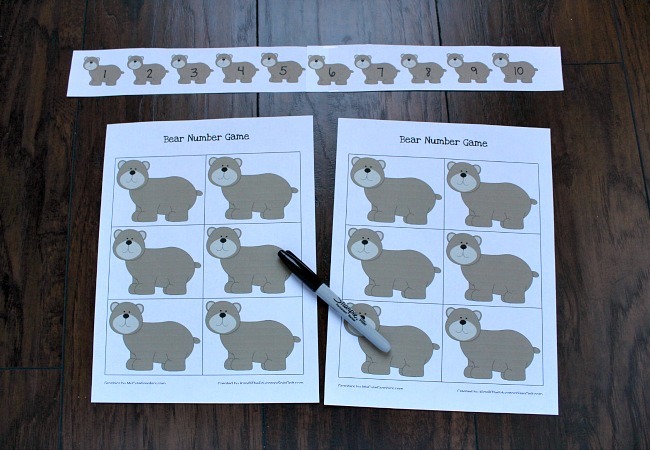 Just print out your bear number game and bear number line here to begin. Time to Sleep is our featured story but there are so many great great themed books to go along with it. Here’s some of my favorite bear books for preschoolers. We are so excited about all of these ideas for even more bear themed fun. Come share your Bear Themed Activities and explore even more in our Virtual Book Club facebook group! Join here! I love your game – super cute printable! Thanks Maryanne! Love being able to combine movement with printables. Hi, I´m a spanish mother and I love the ideas that you give us to do with our babies, you do a great job and I always know where to look for something to do when we are bored. Thank you very much. Thanks so much for your kind words. Let us know if you’re every looking for something specific. Love creating new ideas for parents.